Since 1993, we are internationally known Arizona beekeeper experts in African bee removal, honey bee removal, honeycomb removal, Africanized killer bee control, wasp removal, wasp nest removal, aggressive wasp control and are beekeeping and bee removal specialists. We are not just a pest control company. We have provided emergency bee removal and wasp removal services throughout central and southern Arizona since the advent of Africanized honeybees (killer bees) arriving in Arizona in 1993. We are beekeepers from Arizona Bee Products, which is a large commercial wholesaler of Sonora Desert bee products. Each Arizona bee removal specialist is a professional beekeeper who practices beekeeping and apiculture and knows bee control and how to safely handle a bee colony whether they are Africanized honey bees or European honey bees. Prior to African killer bees being discovered in Tucson, AZ in 1993, we sent beekeepers from our staff to Mexico to study how the invasive species would affect our commercial bee hives. We began developing techniques to protect and secure our commercial bee hives. As a result, we are the oldest beekeeping company that specializes in bee removal, bee control and bee swarm removal in Arizona. AAA Africanized Bee Removal Specialists, Inc fully licensed to perform bee control, wasp control and pest control service in Phoenix, Tucson and surrounding Arizona cities. Each certified bee removal specialist is individually licensed in addition to being a professionally trained AZ beekeeper in beekeeping and honeycomb removal. We are beekeepers and real bee removal specialists. Unlike a traditional pest control company, our only business is the control and removal of African bees, honeycomb, wasps, wasp nests and the repair and restoration of your home due to it’s damage. A pest control company might offer bee and wasp removal services, but it’s typically a secondary service provided by those that may not necessarily be fully trained in both removal and restoration practices. Honey bees, honeycomb, bee and wasp pheromone and wasp nests can severely damage your home in a very short amount of time. Additionally, as we are specialists in these services, we know how to ensure that the bees and wasps do not return. These insects have a wide variety of naturally built in methods of finding their way into abandoned or cleared homes. Even if you’ve had a wasp nest or bee honeycomb cleared out, the chances of another swarm finding it and moving in are very high unless you’ve taken all the correct preventative steps. A real Arizona bee removal specialist is an experienced beekeeper who practices beekeeping, is licensed by the State of Arizona in pest control and is highly trained and experienced in AZ bee removal, both in honey bee removal and African killer bee control, honeycomb removal, bee swarm removal, wasp removal, wasp nest removal and wasp control. 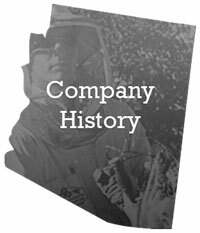 As bee removal specialists, we are extremely proud of the fact that we were able to assist the people of Arizona with their bee removal problems, from the advent of African killer bees arrival in Arizona to the present. We now have many bee removal competitors that do not understand that a honey bee colony requires, whether Africanized bees or otherwise, special handling and care. Bees, Africanized honey bees or European honey bees, cause extensive damage to a residential or commercial building structure, both from the application of bee pheromone, and honeycomb deposits. Improper methods worsen the damage and always invite future bee infestation or wasp infestation problems. Don’t risk the disaster of a poorly done job, call us first! We are beekeepers and real bee removal specialists and wasp removal specialists. 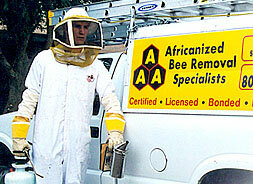 AAA Bee Removal Specialists have offices throughout the Tucson and Phoenix areas. Get the service you need by clicking on the of the areas below and give us a call and we will be happy to help you get rid of your infestation!